Thanks to CNN's abandonment of the James Ray trial, we missed what looks to have been an exciting couple days of testimony. The trial resumed from its Luis Li induced hiatus on Thursday and ended the week in the high drama of perjury charges and another announcement from the team Ray that they will attempt to have the case thrown out. What follows is a round-up of the meager news coverage available. From the Associated Press we learn that Brandy Rainey found the sweat lodge unbearably hot and that Tom Kelly covered at least two of the three pillars of the defense's strategy as outlined here. I don't know from news reports if Kelly hinted at the poisoning thing and it will be interesting to see how they handle that after Dr. Dickson rather thoroughly discredited it. (I have little doubt, though, that Truc Do is gearing up to beat that dead horse for many more painful hours.) But we do know that Brandy Rainey was thoroughly reminded that she was solely responsible for her own misery as heat and steam scalded her throat, leaving her extremely ill after only five of the eight rounds. Rainey said she only skimmed the waiver. During questioning from defense attorney Tom Kelly, she said she never communicated her concerns directly to Ray, who has pleaded not guilty to three deaths stemming from the ceremony. While she had a headache, stomach cramps and flushed skin, others were in worse condition. Rainey and other witnesses have recounted people vomiting, violently shaking and experiencing delusions from the sweat lodge. Kelly pointed out that Rainey made that decision on her own, "as a strong, independent, professional woman, that you were going to stay there through five rounds." From Mark Duncan we learned a bit more about Rainey's direct testimony. That waiver she signed, which only said that there may be a sweat lodge with sauna like conditions, left her unprepared for both the sweat lodge and its very not sauna-like heat levels. Rainey was "in disbelief" after the rigors of the week that they would in fact have a sweat lodge but she was determined to get her "money's worth." But the sweat lodge was even hotter than she had imagined, even though Ray had warned the group that they would "feel like our skin was burning off." She said the heat made her nauseous and, when Ray poured water on the hot rocks, "the steam sort of rolled over your body and went up your nose and down your throat." After finally leaving the lodge, she said she was too weak to stand for some time, so she sat in a chair and watched a scene that has been well-described by previous witnesses in the trial, which began March 1. She saw Lou Caci come out of the lodge, badly burned after crawling through the rock pit, and witnessed Dennis Mehraver's shouted ravings about his belief that he was having a heart attack. She said she never saw Ray doing anything to help any of those in distress, including her friend Amy, who was dragged unconscious from the lodge. "I was coherent," she said. "I don't know if I was thinking clearly. If I was thinking clearly, I would have thought, 'Maybe you should get checked out by the paramedics right now.'" Rainey was briefly hospitalized over concerns of carbon monoxide poisoning, which we now know was ruled out. It's pretty clear that she suffered severe heat related illness because her body's set point has changed. She now gets rashes and blisters in heat as low as 100 degrees. We also have to rely on Mark Duncan for coverage of Mark Rock's testimony as I've been able to find no other. It was apparently quite dramatic. He was accused of perjury and Judge Darrow suspended proceedings until next Wednesday to allow him to consult with court appointed counsel. 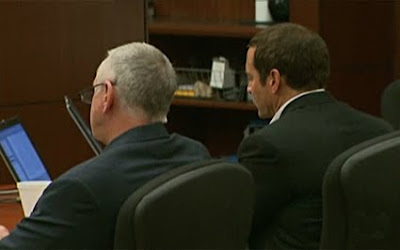 At issue are three alleged false statements, one of which came to light during the trial's mid-morning break. Yavapai County Attorney Sheila Polk reported to the court, with the jury out of the courtroom, that Rock had just told her he had been asked by fellow members of Ray's volunteer dream team not to cooperate with police. 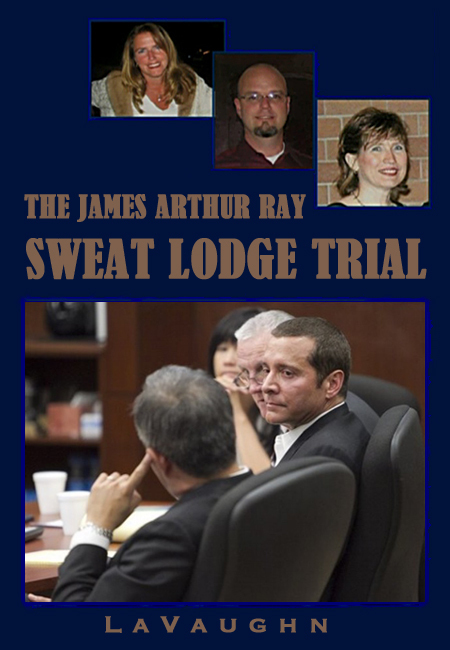 "That night," Polk said, referring to Oct. 8, 2009, the day on which a Ray-led sweat lodge went bad and resulted in three deaths, "(A dream team member) told him not to talk to the police because they are trying to frame James Ray." Those statements, Polk said in court, are less important than the defense gives them credit for because they may well be a result of the stress Rock was under on that tragic day and are clear targets for impeachment on cross-examination. "His testimony is what he recalls today," she said, "and those would be areas to impeach him on. It is appropriate to confront the witness with prior inconsistent statements." They certainly have used such inconsistencies as impeachment material previously, so either these inconsistencies were far more egregious than they appear to be from Duncan's accounting, or this is more of the desperate grandstanding that has become de rigueur for the defense. This will waste yet another trial day. But not to worry. The defense team is also offering to solve the time crunch they are largely responsible for creating. They will present a motion to acquit at the end of the State's case in chief, contending that prosecutors have not met their burden. Prosecutors still intend to come in on schedule after another abbreviated week of testimony, wrapping up their case next Friday. Over the break Judge Darrow disallowed two of their intended witnesses, Dr. David Kent and Douglas Sundling.